Do you have a storage cube that could use an update? A DIY makeover doesn't have to be a complicated one. 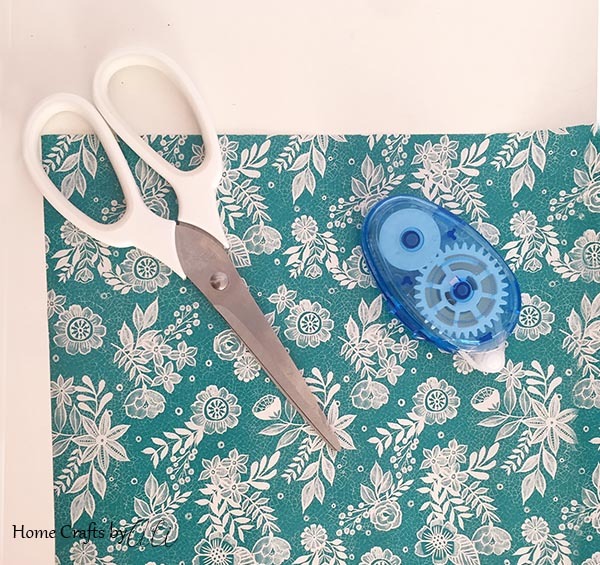 This step-by-step tutorial will show you how easy it can be! Giving an old piece of furniture an update brings new life to the piece and gives the space a whole new feel. 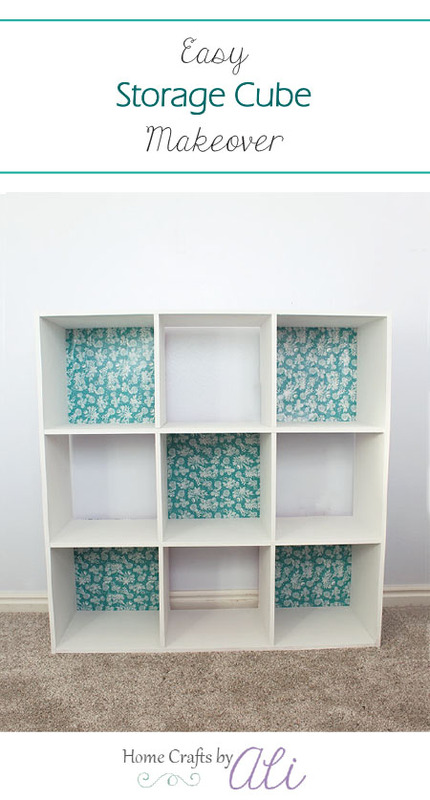 Having this crisp and cleanly white storage cube brightens my craft room. This post contains affiliate links. I will receive a small portion of any sale in exchange for advertising products. You can find these multi-cube storage organizers at pretty much any store. If you have a thrift store nearby, you will probably find a few there too. I saw this one and almost decided to pass it by. A bright pink storage unit would work for my girls for a while, but they would probably become tired of it. Thankfully there was a magical makeover in store for this piece. So if you have an eyesore piece, follow this tutorial to give it a fresh, clean update. 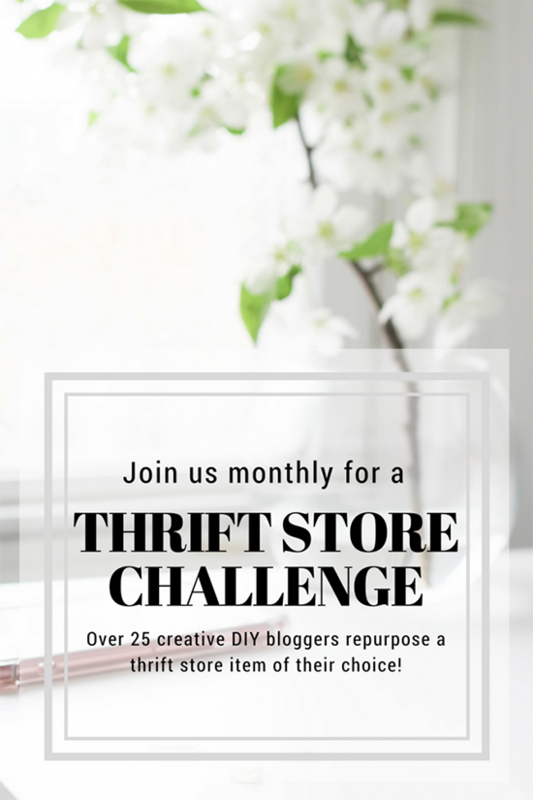 This month I'm joining bloggers for a Thrift Store Challenge. You can find links to their projects at the end of this post. Take a look and you may be inspired to makeover a piece you find at a thrift store! I'm all about easy projects. Even better are ones that don't take very long. I think this whole makeover (including paint drying between coats) took 2.5 hours. That's not too bad! But before I get to the tutorial, I'm sure you want to see what this piece looked like before the update. Here you go! Yep, bright pink! Nice for a little girls playroom for sure, but it wouldn't look right in my craft room. So with a little work and time I happily transformed it into a nice decor piece that is useful as well as pretty in my crafting space. You can do the same too and it's easy! Remove the cardboard backing off of the storage cube. I used the back side of the hammer to get between the cardboard and the cube organizer and removed the cardboard. Sand all the surfaces of the organizer. Any part that will be painted - including inside the cube openings and the top or each cube. 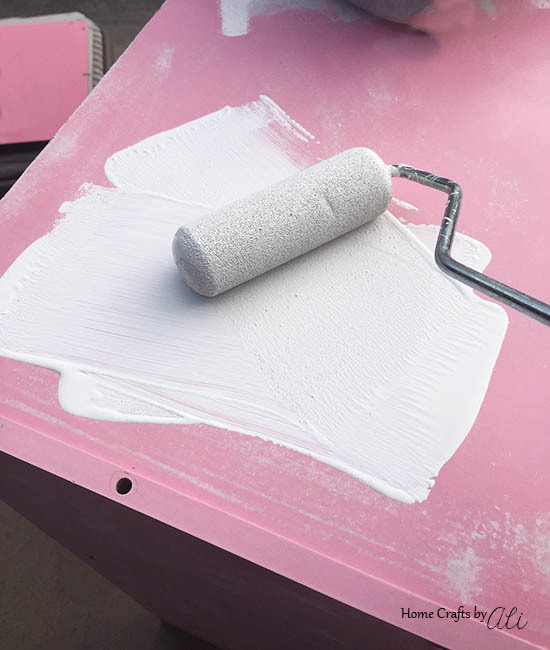 You do not have to be thorough and remove all the paint, just scuff the surface so your new paint will stick to the surface of the storage cube. With a damp cloth, wipe the storage cube surfaces. You want to remove any particles of dirt or loose paint that was sanded. 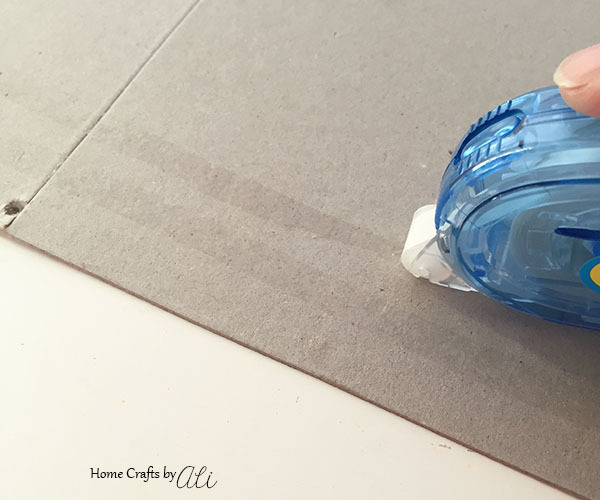 Wipe with a dry cloth before painting. You can use a brush, roller, or paint gun to paint your storage cube. I used a small roller and had a nice smooth finish. It took 2 coats of paint to cover the organizer. Wait 15-20 minutes in between coats of paint - you want it to be dry to the touch. 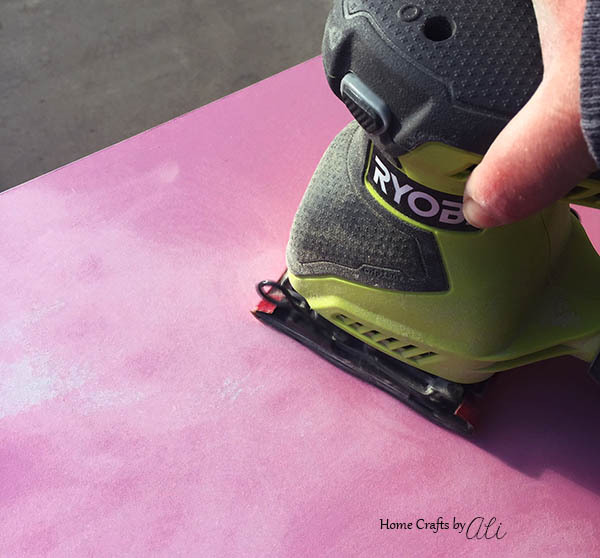 While the paint is drying, you can add your colorful paper to the old cardboard backing. I cut squares of wrapping paper (found at Dollar Tree). Using double sided tape, I put the paper onto the old backing of the cube organizer. When the paint is dry, attach the pretty paper backing to the back of the storage cube using a hammer and nails. And there you have it! Six easy steps and you will have a pretty piece perfect for your space. DIY projects don't have to be intimidating! You can perform a beautiful update for your storage cubes, bookshelves, and even entertainment units. I'm filling up my spaces with lots of my crafting supplies and photo staging items. Wood pieces, canvas, linens, colorful dishes, and my button collection are making their home of my "new" organizer. What will you keep on your updated storage cube? Thanks so much Angela! It is a fabulous paper. I'm surprised by how many cute items I can find at Dollar Tree to craft with. This is such a smart idea! 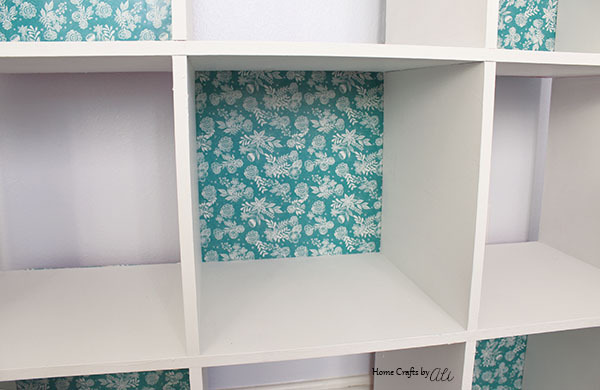 My daughter has 2 of these shelves in her room and now I want to cover the backs with pretty paper too! You should totally do it! 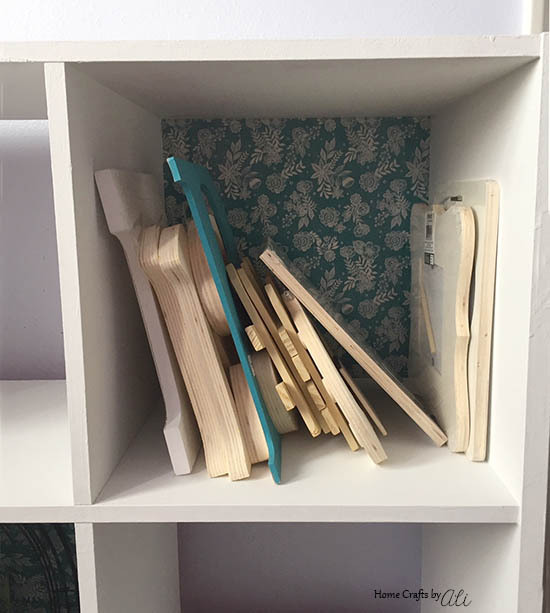 My next project is doing a similar makeover to a bookshelf. I'm thinking maybe with a map this time. I am SO JEALOUS that you found this at a thrift store! 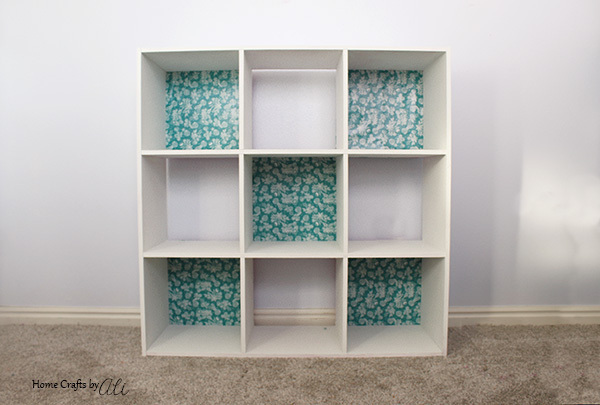 I love the paper backing idea and will definitely be using that on my Ikea cube shelf!! I'm always surprised what I find at the local thrift store. Each time it's an adventure! Every craft room needs these cubes. Great job on the makeover. Thanks Denise! It's getting filled up pretty quickly. I've got to keep my eyes open for another one! This turned out so nice. The white really brightened it up and it looks like the perfect storage solution! Nice job. Thanks Michelle. I love the white so much better than the bright pink! Very pretty! 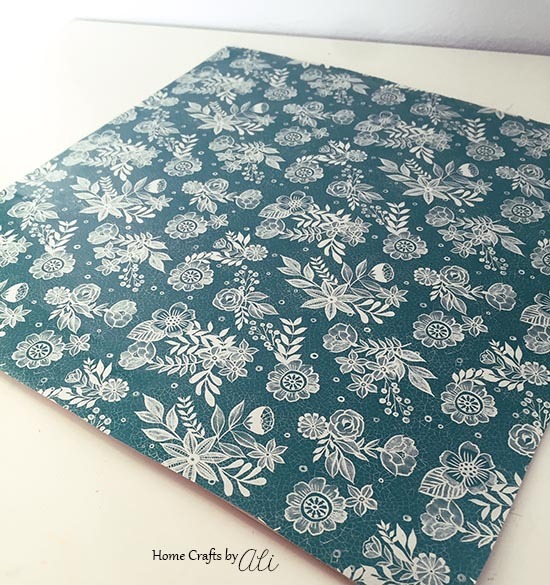 What a great idea to add pretty paper in the background. These storage cubes are the best! They really are so useful. I have another smaller one I'm going to redo for my newly decorated living room. 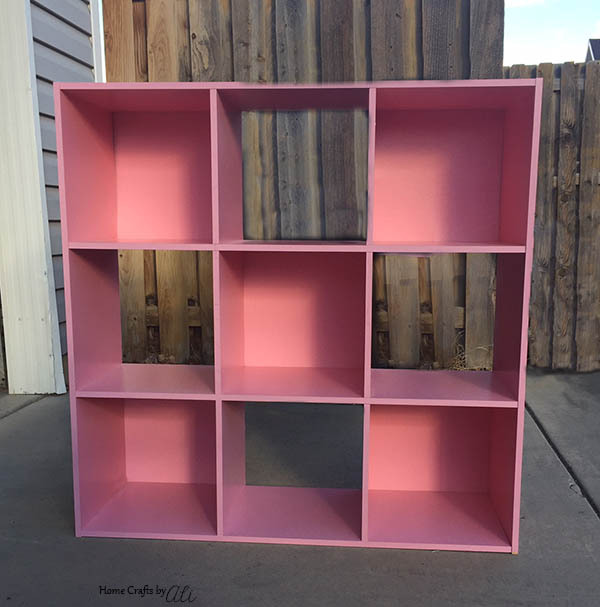 I love cube storage and never thought about being able to do a makeover on them! My kids have a bright blue one in their playroom that I considered getting rid of. Now I am definitely reconsidering that! What a fantastic makeover. I love the paper you used. A very stylish way to be organized. This is awesome! Love the paper you used! Thanks Michelle! The paper was a great find! This is a great upcycle it adds charm to the whole piece. Ali, your storage cube turned out nice. I had one once, but when I updated my kitchen the last time I got rid of it. I added milkglass to some cubes and a light bulb behind. Reduced the storage but looked nice. What a fabulous idea! I have one section filled with my Pioneer Woman cups and plates and love to look at the beautiful colors.